Views over the pasture to the magnificent karri forrest. The homestead has changed over time, retaining the charm of its history but with added amenities. The main bedroom is large with a queen bed and an adjoining space with an extra single bed. The second bedroom has two single beds. On the edge of pristine karri forrest. Keen explorers can trek through the forrest trails and find the permanent creek or look for the native birds or wildflowers. Upstairs is a large master bedroom with a queen bed. A second bedroom has two single beds and a separate mezzanine area has two more single beds. There are two living areas, one upstairs and the other downstairs. 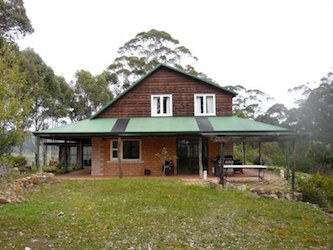 The lodge is a kilometer from the front of the property so you can really enjoy the peace and quiet of country. 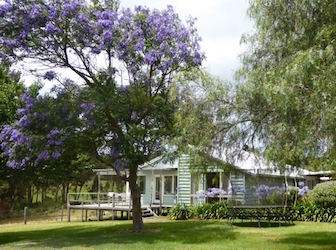 All linen is supplied, there is a wood-shed where you can get wood for fires, electric blankets on beds to keep you cosy in winter, TV/CD/DVD/stereo, microwave, BBQ, wood heater, iron, ironing board, hair dryer, coffee plunger and your cooking utensils. There are even have a few books and DVD’s for you to relax with. * Children and adults are the same rate for linen hire and bed making. ** Infants are no charge if guests bring their own a cot. Any pets must be by prior arrangement and exclude large or dangerous animals or breeds. Guests must provide bedding, bowls and other supplies. Pets are not to be left unattended on the property, are not to go into bedrooms or on furniture. There is a one-off tariff of $65 per pet and a bond of $100. Check in is available 3:00pm and check out time is prior to 10:00am. CANCELLATION CHARGES APPLY: for more than 30 days notice of cancellation an administrative of $65 will be charged. For less than 30 days notice a one night’s accommodation deposit is non-refundable. These charges are in addition to booking agent fees if guests have used an agent. For less 7 days notice the booking is non-refundable. The cost of any unreasonable damage, excessive cleaning caused by guests or added time for cleaners due to late guest departure will be charged to the guest. Costs may be deducted from any bond.